The Bake Off continues! This week, they made tiramisu, which is a fairly classic dessert but unfortunately I hate everything about it. I hate the taste of coffee. I don’t really like brandy-soaked sponge because it always seems soggy every time I eat it, and I have never understood why people would want to eat it! But, keeping up with the challenges, I had to persevere. The real trick to this cake is to make sure you don’t over-beat the sponge so that it stays light and rises a lot. This will allow you to cut it in half more easily. Also, take your time! 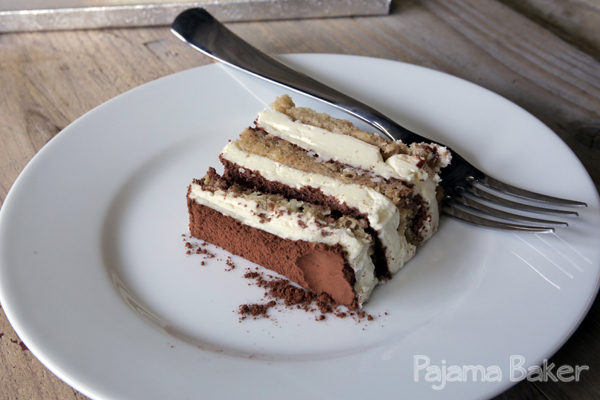 Don’t try to rush it, as rushing will make you mess up and you won’t have the distinctive layers this cake needs. I didn’t have the right sized tins that the recipe calls for, so I only have three layers rather than the four it’s supposed to have, and my tempered chocolate came out all brittle and spotty so I left them off the top – but it still turned out beautifully, and one of the girls at work said it was the best tiramisu she’s ever had – so I must have done something right! 1. Preheat your oven to 350ºF (175ºC). Grease a 15×10-inch Swiss roll tin and line it with baking paper. 2. First, make your sponge. In the bowl of your mixer, whisk together the eggs and sugar for 5 minutes until the mix is very pale and thick. Gently sift the flour over your mixture, and gently fold it in using a spatula until it just combines. Do not overmix or your sponge will not rise enough! 3. Carefully pour the batter into your prepared tin, making sure to keep it level. Bake for 20 minutes until golden. Let it cool in the tin for 5 minutes before gently turning it out onto a wire rack to cool completely. 4. To make the filling, dissolve your coffee in the boiling water, then add the brandy. Set aside to cool. 5. When your sponge is completely cool, carefully slice it in half to create two thin layers of equal height. Then using the base of a 7-inch square cake tin, cut out two squares from each layer so you have a total of four squares. 6. Line the base and sides of your square cake tin with baking paper, leaving enough hanging over the edges that you’ll be able to use them to help lift your cake out of the tin when it’s set. 7. Set your mixer up with a clean bowl and place the mascarpone cheese into the bowl. Beat in your cream and icing sugar to make a creamy frosting that you can spread easily. 8. Place one square of your sponge into the base of the tin, spoon over one quarter of your coffee and brandy mixture, then spread one quarter of the mascarpone filling over the soaked sponge. Scatter the top with a third of the grated dark chocolate. Repeat this process to create your layers for the second and third sponge squares. 9. For the final layer, place the fourth sponge square on the top of the layers and spoon over the rest of the coffee and brandy mixture. Spread a very thin layer of the filling to create a “crumb coat” on the top of the cake, then spread the rest of the filling layer on top in a thicker layer. The crumb coat will help keep any of the sponge bits from appearing on the top of your cake. Place the cake in the refrigerator to chill for at least 1 hour. 10. While the cake is chilling, melt half of your dark chocolate in a double boiler until it reaches a temperature of 127ºF (53ºC). Then remove the bowl of melted chocolate from the heat and add the remaining half of your dark chocolate, stirring until it melts in and it is thick enough to put into a piping bag. Once it’s in your bag, snip off a small corner and pipe to chocolate to make decorative shapes for the top of your cake. Leave the chocolate to set until you need it. 11. Dust the chilled tiramisu with the cocoa powder before you transfer it to your serving plate, using the baking paper to help you lift it out of the tin. Then place your chocolate decorative shapes on top, et voila! You might want to think about putting step 7 back where it belongs….. cos it sure aint here! Ahh! Thanks for pointing that out, baker. I’d copied a template from another post and forgot to type over that step. All fixed now, thanks for catching it! I made this recently and it was fairly easy to make but doesn’t taste good at all. It needs way more sugar to sweeten up – anyone wanting to try this id recommend more icing sugar in the filling mixture and add sugar to the coffee mixture . Mine unfortunately went in the bin….. Thanks for the tip, Ann! 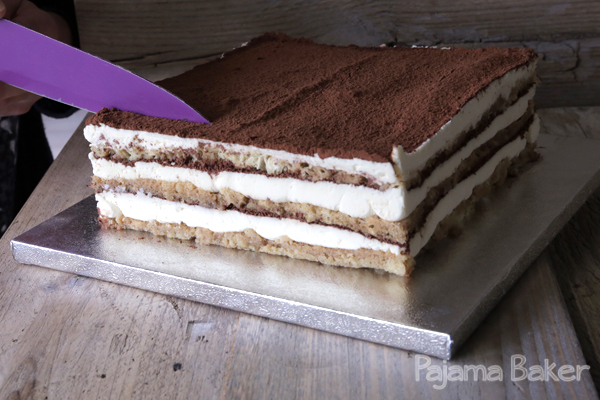 I’m not a fan of tiramisu or coffee myself – so this particular bake went straight to the office without me tasting it! Hi , I have a question about instant coffee granules vs essence of coffee in the tiramisu recipe . On the tutorial, Mary Berry stated that either could be used…I have Essence of coffee and I would like to use it. What would be the amount to use and with how much water? Thank you so much! Hi Rita, to be honest, I am really not sure as I have never used essence of coffee before. My assumption would be to reduce the volume of liquid if you’re using essence as it is more concentrated and I would try mixing it directly with the brandy before spooning over your sponge, rather than diluting it with water. Have a go at mixing the two, adding a bit of the essence at a time until you find a ratio that suits your taste! Since it’s only going over the sponge, it doesn’t need to be an exact science.